Selectable green or amber display. CTCSS and DCS. Standard DTMF encoder and optional decoder. Weather alert scan (US version only). My Icom IC-V8000 never transmitted 75 watts, only about 72, but it didn't really bother me as I almost never used high power anyway. I was warned not to use high power for long rag chews or long keyed periods. I would have liked to have a 50 watt setting. I really like the front mounted speaker, in my mobile installation, I think it was the difference between needing an external speaker and not. I also like the multifunction microphone that allowed allowed you to set just about every setting on the rig with the mic. Even though I had two of them fail on me, I still like it, but I do keep a spare, they are easy to find 2nd hand. My V-8000 is now a backup radio and I don't use it every day, but it is one I'll keep around for the foreseeable future. Estimating the value of a rig can be challenging. 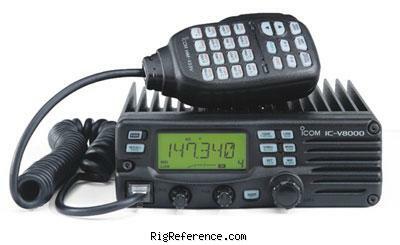 We collect prices paid by real hams over the years to help you estimate the current value of the ICOM IC-V8000. Just bought or sold this model? Let us know what you traded it for and help other ham operators!